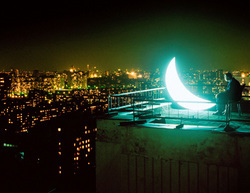 Private Moon is a travelling light sculpture by the Russian artist Leonid Tishkov. Earlier this year, the sculpture was on display at different rooftops in Linz, the European capital of culture 2009. During the exhibition, the public could either take a look at the moon from a distance - or they could borrow it for a while and install it at their own homes.